The music inside continues to prove that the record is indeed one of the most exciting and rewarding of 2008. The first two tracks create a template and tone for the record… there will be noise. There will be volume and unpredictability. Most importantly, all of this will be based on a solid foundation of songwriting. From the squall and sheer power of the album’s opener "Miner", No Age effortlessly fades into "Eraser." This simple-melodic tune builds upon layered acoustic and electric guitars that nicely fill the void left by the absence of a bass player. Nouns follows this pattern throughout. No Age balances loudness with melody, and power with dynamics. Yet, if one were to strip away the hype, the guitar effects and volume, these songs would still stand on their own as genuine compositions. Much like Radiohead, all the innovation, sounds, and production (or lack-thereof) serve only to sweeten the overall package. 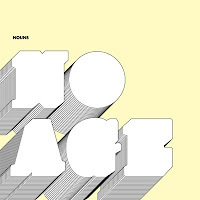 No Age has built their following mostly through the credibility and buzz provided by the L.A. club “The Smell” and their devastating live shows contained therein. Critics (like the New Yorker(!)) often note the deafening volume, and dynamic interplay between drummer/vocalist Dean Spunt and guitarist Randy Randall. “The Smell” hosts a series of excellent acts including Mika Miko, while also serving up vegan goodies and weekend-morning shows. No Age's first record, Weirdo Rippers featured the club on the cover. In the end, one must tip their hat to both Sub Pop and to No Age for pushing the envelope and providing the consumer with a product actually worth buying. Not only is Nouns the most creative music of 2008, the overall experience let's the listener know that this is indeed a special record. No Age tonight at the Bowery!